There is a community of canoeists who frequent the Canadian Canoe Routes website and in particular the forums. Over the years some of these folks have "gathered" to meet in person instead of just through the online forums and by email. 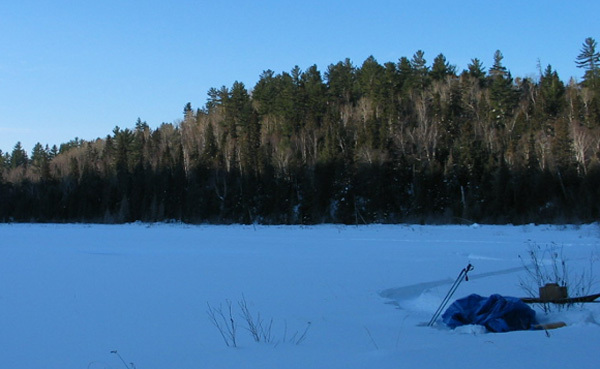 These gatherings have been held both during canoeing season and in the winter or "the hard water" season. Some of the folks had previously done some winter camping together before but these outings have grown somewhat in the last 2 years. 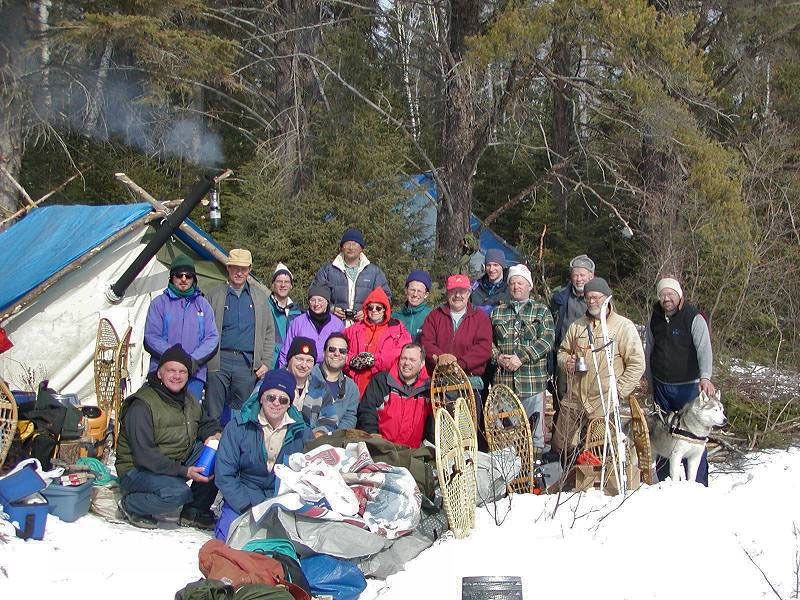 A gathering was held in 2002 in Sudbury and was attended by 8 people. This consisted of a 2 night stay at a campsite along the Vermillion River just north of Sudbury, On Sunday, 4 of us continued on for a trek, however 2 of us dropped out the next morning and the last 2 continued on for a couple more days. 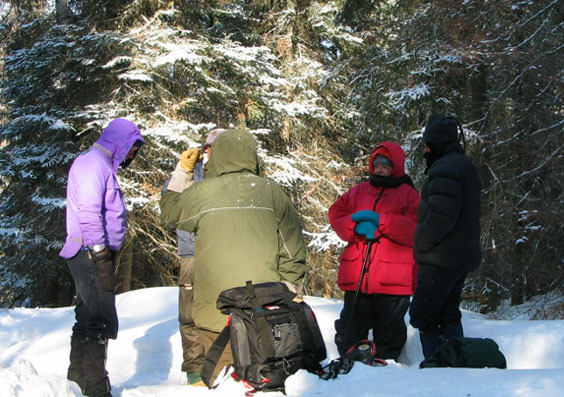 This gathering was of the "cold" or "alpine" style of winter camping using dome tents etc. 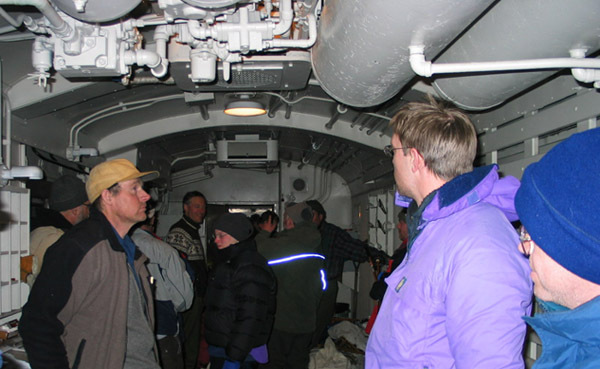 Folks on this trip began to to talk and think about trying "hot tenting" for the 2003 gathering. 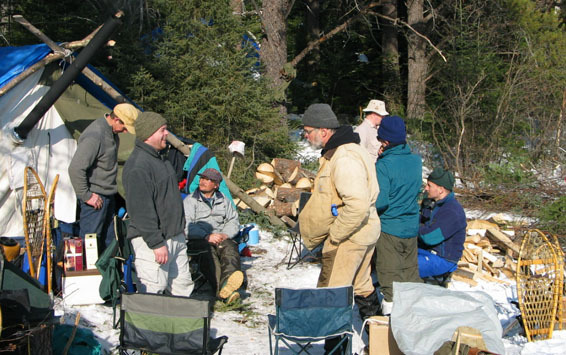 In the fall of 2002, a gathering was held in Algonquin Park, which was attended by several of us who had been to the winter gathering the previous January and a winter gathering and "hot tents" were again discussed with more folks expressing interest in attending. Needless to say what follows is a bit of a description/story of that trip. Who: a forum discussion begins on CCR, people begin to post and express interest, momentum builds and finally Richard sets up a separate thread with a password for those interested and the planning starts to get real busy. Oh yeah, Who? - anybody who wants to go! When: this one can be troublesome, so enough lead time to let all the interested "who" try and convince whoever they need to convince that they just have to go is in order! Then after a suitable length of time where all the "who" try to convince everyone else their dates would be best, someone takes the bull by the horns and "when" is decided, usually with adequate time for all the "whos" to try and work out their attendance if the dates are not the same as their "when". Where: another one that can be troublesome as well. Ideas are floated amongst the "who" and a destination is eventually agreed upon. The most important criteria is to agree on a place that has enough room for all the "whos" to camp close enough together to have a good "what". The ideas came fast and plentiful from all the interested folks and one idea seemed to really resonate with everyone:" lets use the "Budd Car" service from Sudbury, head up the tracks to a suitable area for a gathering. This idea stuck and then several ideas for the "where" started to surface along with a host of "when" ideas. The dates bounced back and forth until finally Thursday Feb 25th to Sunday Mar 2nd was set as the time frame for the main gathering period. As the Budd Car only travels 6 days a week, Tuesday, Thursday and Saturday (Sudbury to White River) and Wednesday, Friday and Sunday (White River to Sudbury) this also impacted on the decision. Two of the attendees, Dave and Hans were actually leaving the Saturday before and heading further up the tracks to camp for a few days in a different area and would then travel back to the gathering area later in the week. Another group of 5 decided to head in Tuesday ahead of the main group for an extended trip. There are many different styles to one of these outdoor gatherings. 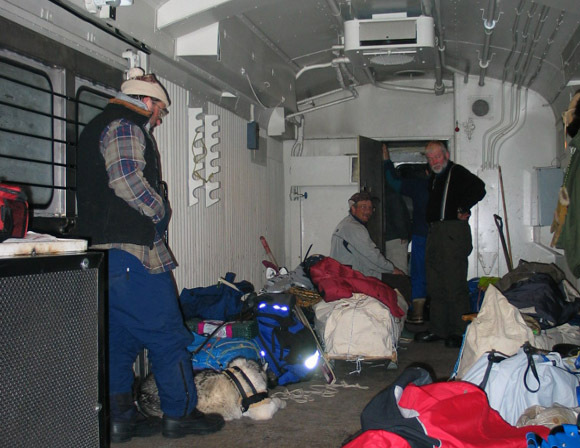 Two options were discussed for this trip, basecamp in one spot for the duration or pack up and move daily to a new spot. In this case a basecamp trip was decided upon, although Dave and Hans did some moving on their early part of the trip. "Where" was discussed at length as well with different ideas floated out to the group. 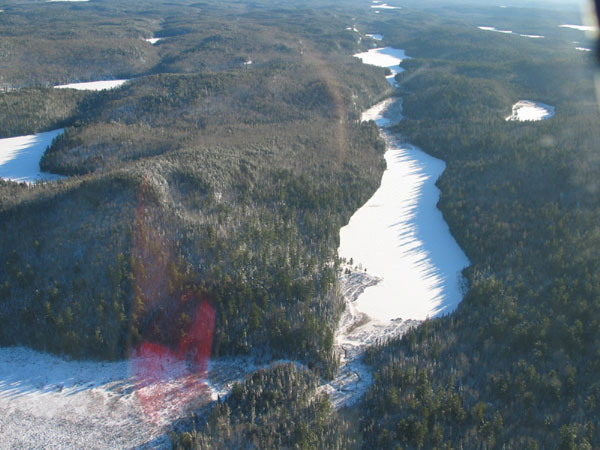 I managed to get a look at an area I had picked out on the map from an aircraft and it seemed to suit our requirements, with trails and lakes to make traveling on snowshoes and hauling sleds easy, lots of firewood, a sheltered area for camp setup and several lakes to try our hand ice fishing in. Along with all this planning, a discussion around hot tenting vs cold tenting was also in progress. At the end of the day the camping arrangements turned out to be as varied as the folks attending. 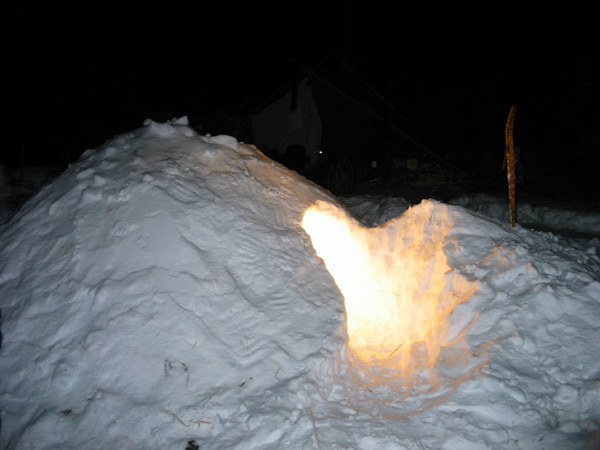 There were 5 hot tent setups at the gathering, 3 "prospector" or wall tent setups and 2 different homemade tents. Richard made a lightweight nylon copy of an "explorer" style tent and Merlin (Dan) and his wife Joyce used a modified canvas tent portion from an old tent trailer they had. 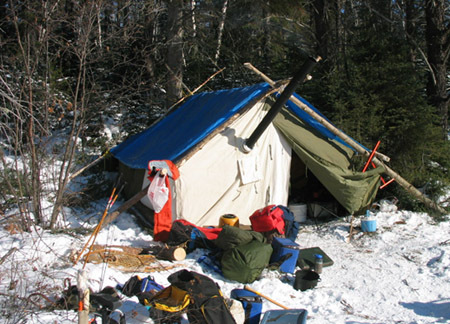 These 5 tents all used small wood stoves for cooking and warmth. 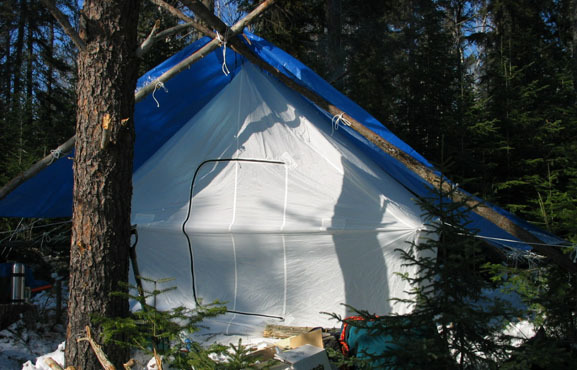 Dave had a custom made nylon/canvas wall tent, Scouter Joe had a commercially made canvas wall tent and I modified a nylon wall tent by sewing in a canvas corner where the stove would be. 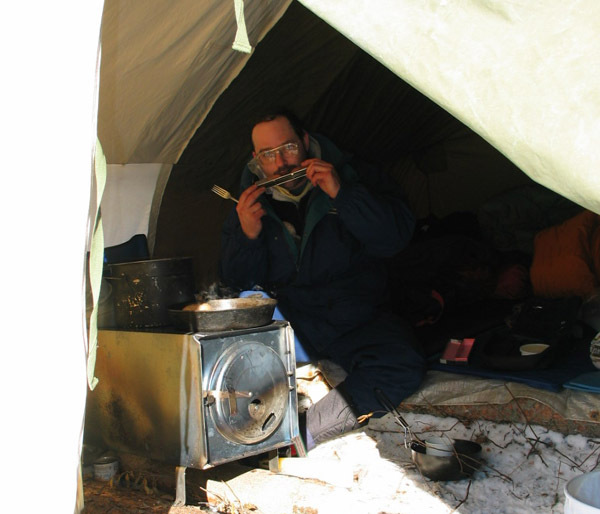 Dan's tent was long and narrow with the stove on one side and Richards tent was constructed with a canvas panel in the rear where his stove was set up. The rest of the gang slept either in small dome tents or under a tarp or in one of several quinzees that were built. 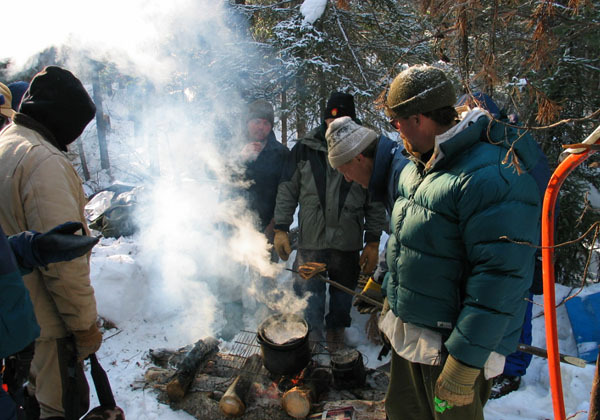 The different groups also combined to cook their meals as a group also, as this cuts down on the duplication of gear and weight you have to haul on your sled. Like the tents everyone had different ways to haul their gear into the site. 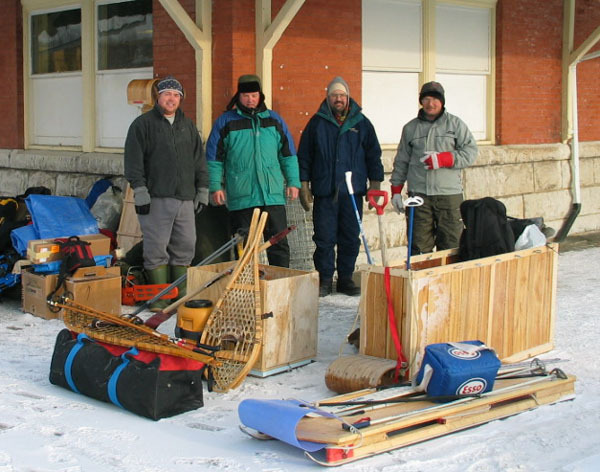 Dave Hadfield has a website that contains information on home made outdoor gear, stoves, sleds etc and there were many variations on his basic sled constructed with old downhill skis. In addition, several folks used lightweight plastic and traditional toboggans along with backpacks to carry gear. One interesting rig was Moe F's, a regular toboggan with a wooden box attached, kinda doubled as a kitchen counter and a bar! Snowshoes are a must when traveling in these conditions and again there were different styles used, traditional wood, modern aluminum frames, plastic and Moe also made a pair out of slats of thin wood with a set of old leather harnesses tacked on...Moe's retired, too much time on his hands!! The dates for the trip approached and plans were finalized. Dave and Hans posted a quick note to forums, see you next week and they headed off for a few extra days ahead of everyone else. Moe worked out his timing and committed to the Tuesday departure along with Georgi, Bill P.,Mike S., and myself. Moe was in early but he was also to leave early to head down to the Kearney area for another yearly outing with the boys at the hunt camp! 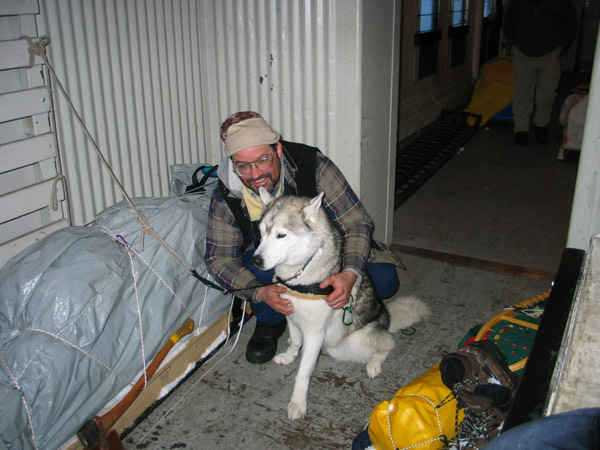 Bill picked up Mike and Georgi and headed for Sudbury along Mike's husky, Nakina on Monday and arrived around supper time. We did some quick planning and sorting of gear, cut a piece of styrofoam for the "thunderbox" and watched the "weather forecast" for the next week - cold! 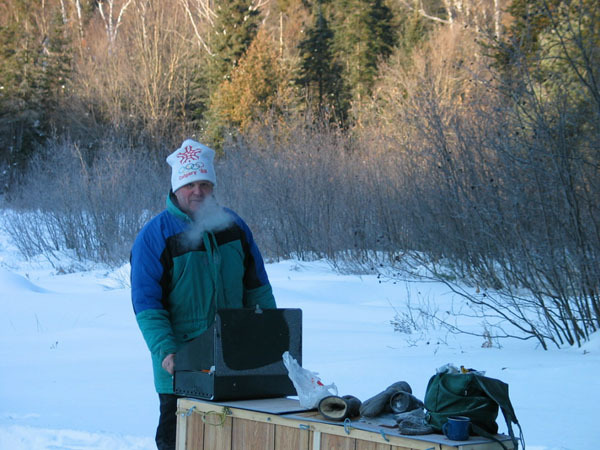 as in -30 degrees C.
Tuesday dawned and while having coffee Moe arrived from his friends place just north of Sudbury. We packed and headed for the train station all marvelling at the temperature - cold! The train was more or less on time and after quickly throwing everything up into the baggage car we all piled in and we were off on another adventure. The trip up to our drop off point was spent mostly hanging out in the baggage car or wandering through the rest of the train - the passenger car! While purchasing coffee from the conductor we spied a black wolf bounding away from the tracks into the bush, a beautiful site for sure. After we confirmed our drop off location with Donny the engineer and Jimmy the conductor we settled in watching the scenery unfold. We headed north past small settlements such as Benny and Sheehan along the Spanish River where the railway runs. Soon we arrived and the train slowed to a stop and off we went and in the space of about 4-5 minutes we were standing there in the cold watching the train roll around the curve and disappear from sight. We spent a few minutes loading and tieing all our gear on the sleds and we started off down a trail the local trapper has cut into the first lake we would be crossing. It didn't take too long to figure out that we were going to have a few problems getting to our destination. Due the extremely cold winter and lots of snow, we were sinking quite deeply into the snow and it was a struggle to keep the sled moving especially for the person breaking trail. 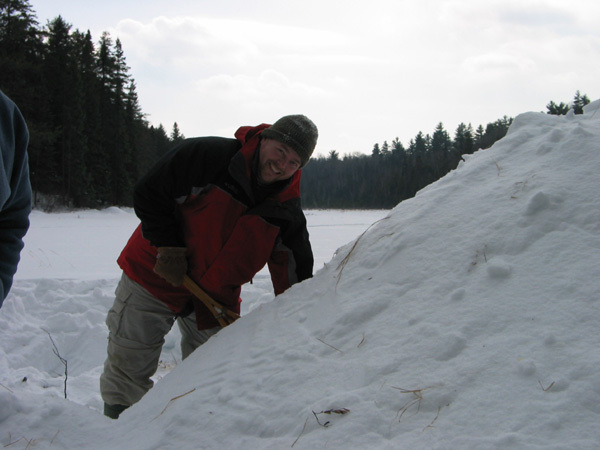 After struggling along and repacking sleds, fixing a snowshoe or two, I decided to leave the sled and break a trail to the lake first then haul the sled. 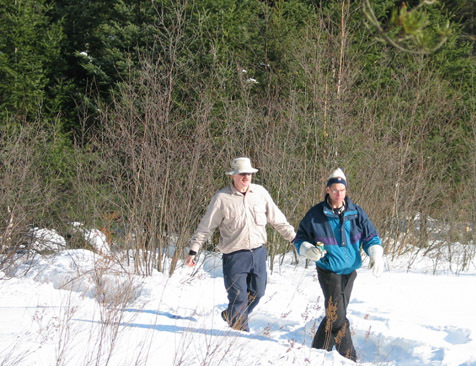 This turned out to be the answer when in deep powder snow in the bush or protected areas. The small lakes were very windswept and not a problem to travel on. We managed to make it to the second area where we would have to cut through a creek system and bush area into the next lake. This area had snow that was even deeper than our first and we soon bogged down in the powdery snow, in fact I was sinking up to my waist even on snowshoes! After struggling for awhile we decided to retreat to a sheltered area at the end of the swale and set up camp as it was starting to get late into the afternoon. One thing to always keep in mind at this time of the year is the short days/long nights. 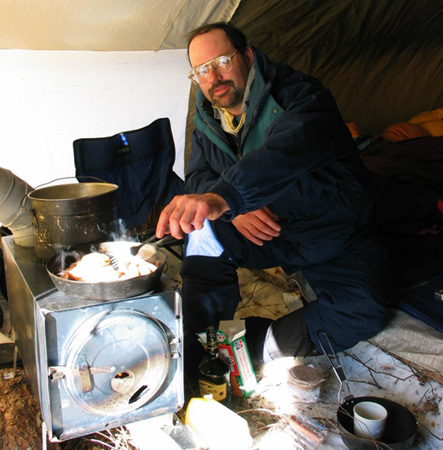 While 4 of us set about making camp, cutting poles and firewood, Mike began to make a huge batch of clam chowder for supper! 30 below zero and Mike is making one of the best chowders you can have, sometimes life is too good. After setting up and arranging everything, eating supper and having a glass of wine it was evident that everyone was pretty bagged and sleep came fast and early especially in a warm tent. Wednesday dawned clear and cold. After a prolonged and leisurely breakfast of bacon/sausage/eggs/much coffee and fresh baked muffin, we began to improve conditions around camp. A spot was picked and the thunderbox installed, tent pads and poles were cut for the groups coming in on Wednesday evening (Dave/Hans) and Thursday afternoon. Dave and Hans arrived around 4:30 that afternoon and set up just down the way. Everyone was again pretty played out from the days activities and another early night was in store. The morning was again taken up with another long leisurely breakfast and camp chores plus visiting with Dave and Hans, Somewhere around 1:00 or so in the afternoon there was a bit of a commotion and the rest of the gatherers arrived - 13 strong. Georgi went out to meet them in shorts and Moe was wearing his bug net hat. After greeting some old friends and new - tent areas were pointed out and everyone set up their accommodations in between visiting etc. More firewood was cut and split etc. Once everyone was set up people wandered around camp visiting and looking at all the different setups and equipment being used. Friday morning our tent again settled in for what was our now normal practice of a long leisurely breakfast, must eat! Suddenly the tent flap was pulled back a shovel thrown into the tent and Georgi was called to get moving, time's awasteing - it was Scouter Joe and today was quinzee or snow shelter construction day! 3 quinzees were soon under construction, pile snow, let it set and then hollow out a sleeping chamber or at least that's the theory. Tony C. was doing just fine when his suddenly collapsed on top of him. There's a fine line there where you can't shave too much snow off or it will collapse. Sam, Kate and Lloyd's quinzee plus Georgis survived this stage and were left to harden in the cold. While this was underway, we also hauled some fresh snow to re-level the sleeping area in the tent. well...the light at least looks warm! Whilst this was occuring there was more visiting and even an outdoor eucher tournament going on in the sun along the sheltered treeline of camp, Moe F. had to depart in the early afternnon to catch the train so he headed off to his second engagement after saying his goodbyes. Bill and Jim walked out with him to the tracks to meet the train and then did some ice fishing on the way back. 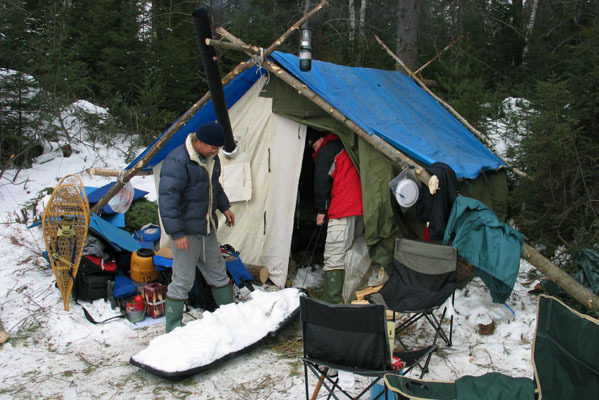 That night Georgi elected to stay in the tent again but the others stayed in their quinzee and passed a comfortable night. 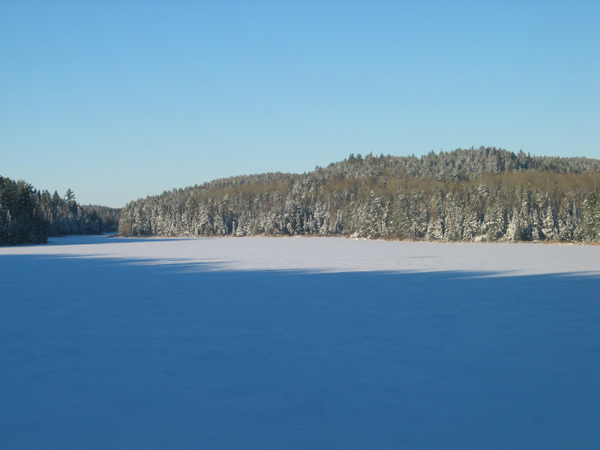 Saturday was another gorgeous day and a group of us headed south through the next lake over a trail into another lake where several of us tried our hands at ice fishing. In fact, the ice fishing was tried in 3 different lakes over the course of our stay but sadly the fish came out on top in this contest. A few small pike (Bill claimed he had eaten bigger hot dogs than these fish!) were all we had to show for our efforts. That night Georgi spent the night in his quinzee with Jim B., Georgi reported a comfortable evening except that his shoulder was a bit sore in the morning, however that turned out to be from Jim smacking him as it appears that Georgi snored a bit! Sunday arrived and it was time to head back out to the tracks and wait for our ride back to Sudbury. 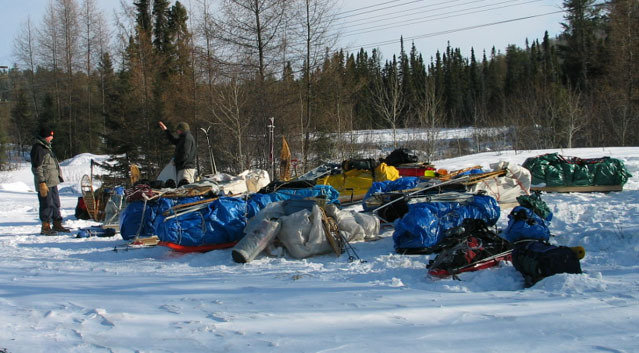 Everyone packed up their gear, tent poles were stacked away and the area was scoured for any gear and/or garbage etc. It turned out that Sunday ended up being the coldest day we experienced and it came with a strong northerly wind for the hike back to the tracks. Once everyone was there we retreated back into the bush out of the wind and starrted a fire for tea and a bite to eat. Since it was so cold the Budd Car was also running late and some of us paced up and down the tracks and some stood around the fire and we all strained our ears listening for the train's whistle to announce it's arrival. 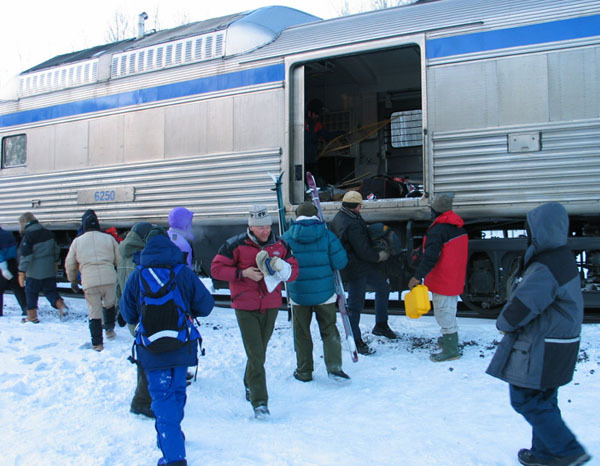 Suddenly around the corner it came, slowed to a halt and the door to the baggage car slid open and 20 people and 18 sleds were loaded in the car quickly and we were on our way, a bit late but man were those warm cars ever nice! Normally it's about a 3 hour ride to the Sudbury train station, but due to a slow travel order on the tracks due to the cold weather and then with a frozen switch problem in Sudbury we didn't arrive to the station till almost midnight and it hadn't warmed up any either! The baggage car was quickly emptied and goodbyes were said all around with the promise to "lets do it again next year" the most used phrase of the night. Folks headed home or to the homes of the Sudbury contingent for the evening for morning trips home.